Two of the biggest factors plaguing Tyrol Ski Area in the mid to late 1960s were size and accessibility. 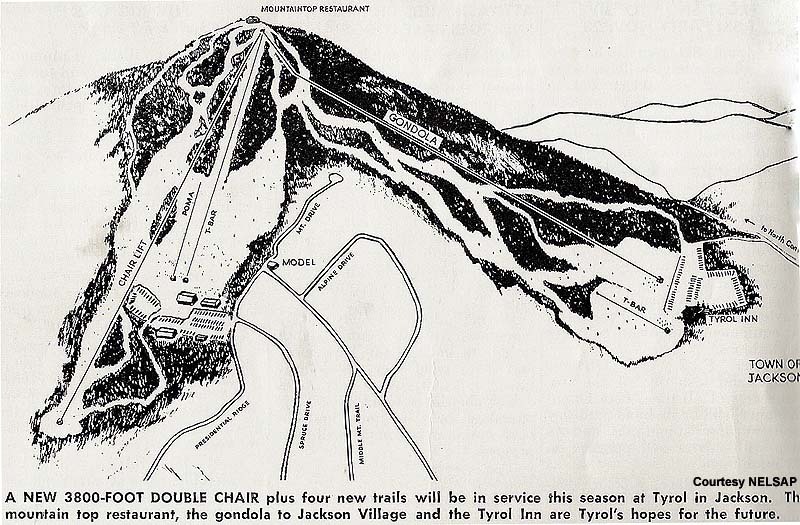 With major areas such as Wildcat and Attitash growing, the ownership of Tyrol planned a sizable expansion, the first phase bringing the double chairlift into Dundee Valley. The second phase of the expansion would have been much more dramatic in scope - a gondola, T-Bar, multiple trails, and a new base area were to be constructed on the west slope of Thorn Mountain. Not only would this expansion made Tyrol a large ski area, but it would have also allowed for much better access. Rather than having to drive up the mountainous secondary roads, skiers would have been able to simply start their day in Jackson Village. Tyrol's growth ended with the 1968 double chairlift expansion, however, leaving the ski area's fundamental issues to eventually led to its demise.